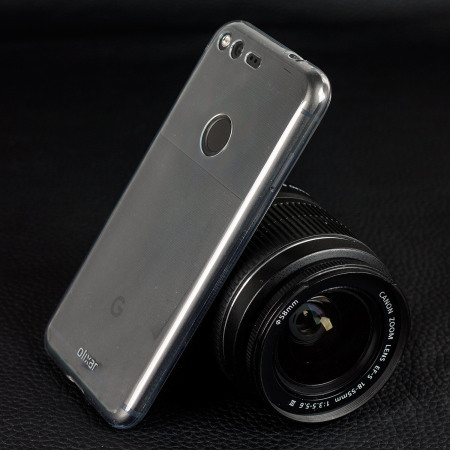 Custom moulded for the Google Pixel, this clear Olixar Ultra Thin case provides slim fitting and durable protection against damage. Its perfect and was reasonably priced. Good product. Exactly as it is described. Fits phone great and makes it look really nice. Drop my phone loads and it's been fine so far. I like this phone case, it's much better than the original one by Google. It's not that stiff, so it's easier to manage, and looks sturdier. The material has a grip to it so it's harder to accidentally drop the phone. It looks a bit nicer too. I tried some other ultra thin cases, but they were too slippery and I was worried I would drop my phone. This case is smooth, but its texture has just enough "grip" to it to make me confident that it won't slide out of my hand or off of a slight incline. I doubt the case would offer a lot of protection if it were dropped on concrete, but would avoid scratches and provide a bit of general protection. Overall, I really like the ultra thin form factor, and would recommend it. Great case. Hardly adds any bulk to the phone. A lot cheaper online than in stores for a case. Just keep in mind the delivery times as it ships from overseas. This cover is ideal for the job in hand. It's lightweight and gives a good grip as well as being pretty thin so doesn't bulk up your phone but the protection is still good. Great value for money. I like clear covers as you can still see the back of your phone and who doesn't want to show off their Pixel? This one does the job! I never liked to hide my phone into a case, but they are necessary these days. When I looked for something easy I found this Olixar Gel Case on Mobile Fun I thought it will do it. When a case arrived a few days later, I was surprised. This is a really amazing cover, almost invisible, I love it. Unfortunately, my wife took it from me, she has a GPixel as well, so I must order a new one now... Anyway, amazing service, quick delivery, good product. Recently i have taken a package of Blue colour Google pixel phone, but tt got scratched within the seven days of receiving, so i become worried and was unable to find any suitable things which will enable me to cover and protect without hampering it's original look.Thanks mobilefun to offer me such a wondrful ultra thin gel case. Now it seems got a better looks than previous. I initially bought a generic "slimline" gel case but found that it added an unacceptable amount of bulk to the handset. Replaced with this *properly* slimline case and it's perfect! Adds hardly anything to the phone, takes nothing away from the looks and, just as importantly, gives good protection... I've already fumbled the handset onto tarmac from waist height and the case took the knock rather than the aluminium. Perfect. Cheap. Slimmest case I've gotten so far. Light. Protects all corners and screen if facedown. Buy it. You won't regret it. Better than clear ringke one if you want the bare minimal. Slim like the bear motion one. But comfortable to hold because it's silicone.